San Francisco Giants 2014 World Series Champions Gifts and More! 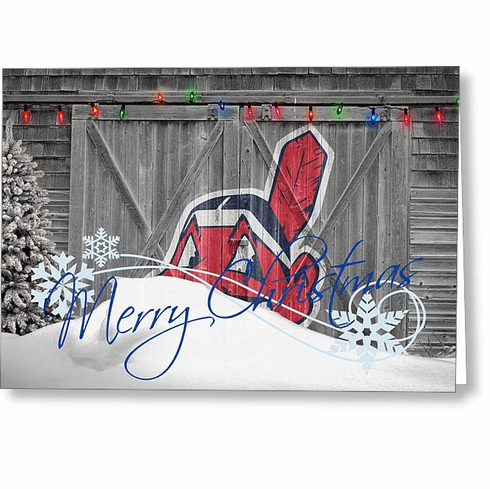 These Personalized Cleveland Indians Christmas and Holiday Cards will show all of your friends and family how much you love the Indians - even during the off-season! Cards measure appx. 5" x 7" and come with white envelopes for mailing or gift giving. These are produced on digital offset printers using 100 lb. paper stock. Each card is coated with a UV protectant on the outside surface which produces a semi-gloss finish. The inside of each card has a matte white finish and can be customized with your own message - up to 500 block characters. All designs created by artist Joe Hamilton. Everything Baseball knows how hard it is to find baseball holiday and Christmas cards so we try to offer new and exciting designs every year. Click here to see all of our Christmas and holiday cards! Sign up for our Promotional Emails! Everything Baseball offers baseball gifts for you and your entire family! Whether you're buying baseball team gifts, corporate sponsor gifts, planning a baseball wedding, or just treating yourself, we're sure to have just what you're looking for! Rest Assured - We've been selling baseball gifts since 2000 and we guarantee your privacy, our site's security & everything we sell! *** Quantity discounts and rush delivery options are available...call for details! Copyright � 2000-2019 Everything Baseball. All rights reserved.